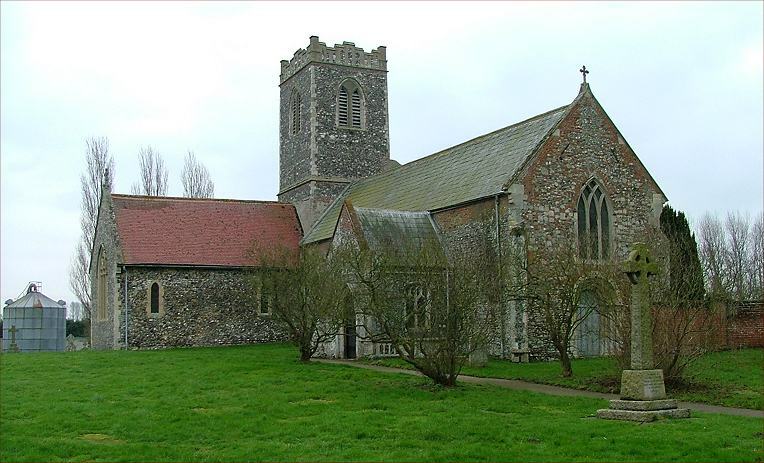 Aldeby is one of those drowsy villages on that rise of Norfolk which is squeezed in the triangle of the valleys of the Yare and the Waveney. Not particularly on the way to anywhere, this area was nevertheless the most populous part of England a thousand years ago, when ease of access by creeks and lanes made it unsuitable for large landowners, but perfect for smallholdings and settlements. It is a reminder that civilisation thrives not where the living is easy, but where ordinary men and women have to work hard to carve out a living. It is also tells us something of why Saxon resilience has survived the Norman invasion. Although entirely rural in character, St Mary has something of the proportions of a large priory church, and that is in fact precisely what it was - indeed, some ruins survive at adjacent priory farm. The long north transept, now a locked store, has the proportions of a small church in itself, and the high, Early English arches beneath the tower make the nave appear long and high. The 15th century font, in common with others locally, has small peasant heads projecting from beneath the bowl, and a Jacobean cover. In the spacious south chancel aisle there is an indent of a shroud brass, and the fine sedilia survives from the time of the Priory. Paintings at the back of the church show designs of an anglo-catholic makeover of the sanctuary. I don't know if this was ever done, but they are certainly dramatic. Perhaps the plain sanctuary of today contributes to, rather than detracts from, the peaceful atmosphere here.